Contrast’s Launch Center Pro, the app that started the small revolution of iOS automation in June 2012, arrives today on the iPad with a new version (sold separately at $4.99) that takes everything you know about Launch Center Pro for iPhone and scales it up to the bigger screen. Launch Center Pro for iPad doesn’t do anything dramatically different from its iPhone counterpart: you can create custom actions, play around with Dropbox and clipboard integration, and do all the things that were possible in Launch Center Pro 2.1 – only now on your iPad too. Today’s iPad launch also coincides with the release of Launch Center Pro 2.2 for iPhone, which brings minor feature additions and new Dropbox text actions. In spite of version number differences, the iPad and iPhone apps have the same feature set. Launch Center Pro for iPad is a bigger Launch Center Pro: Contrast decided to go with a 4x5 grid of tiles where, as usual, you’ll be able to insert shortcuts to launch app actions and other system features with one tap. On the iPad, icons and text labels are larger, but the grid choice won’t allow you to center actions in the middle of the screen like you can on the iPhone thanks to the app’s 3x5 grid. This is a minor complaint of mine, which is alleviated by the way Contrast decided to handle rotation on the iPad: instead of changing the layout of the app completely when you switch from portrait to landscape, the icons simply rotate on the vertical axis, following you around and mirroring the vertical layout in another orientation to reinforce muscle memory, which is extremely important for the app. It’s a sensible and clever implementation, and I like it. But aside from a larger grid with orientation-switching abilities, Launch Center Pro for iPad is, effectively, the iPhone app on a bigger screen. Keyboard prompts are taller and touch targets are obviously larger, but Contrast hasn’t taken advantage of the iPad’s screen to offer completely new features specifically designed for the new device. 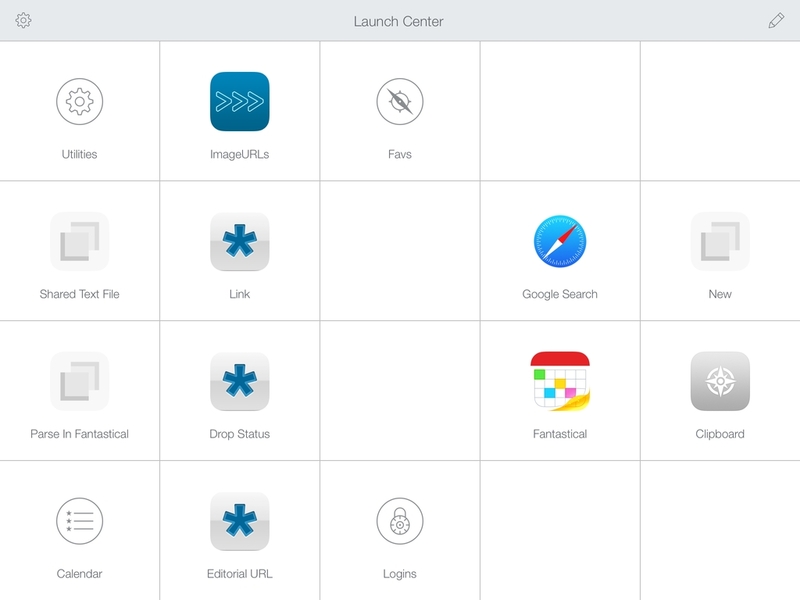 That’s not to say that Launch Center Pro isn’t welcome to the iPad – I’ve been waiting almost two years for this app – but I wonder if there’s untapped potential for Launch Center Pro’s UI on a larger canvas. With today’s updates, Contrast has added some new actions to their Action Composer as well: Launch Center Pro can now define words, speak text, and save text to Dropbox with create, append, and prepend actions. Launch Center Pro’s Dropbox actions aren’t nearly as flexible as Drafts’ when it comes to variables for lines, date, and time stamps, but they get the job done; personally, I’m sticking with Drafts for my text upload actions because I prefer Drafts’ tags and because the app also works with Evernote. Two nice changes of the updated Launch Center Pro are the possibility to launch actions with two fingers and to move them across groups. The first one is especially handy on the iPad: tap a group with your thumb to open it, launch an action with another finger without lifting your thumb off the screen. The Move feature, available in the editing view, feels like a first step towards better action building and organizational tools in Launch Center Pro. You can now manually move an existing action to the Home screen or a folder, but you still can’t drag & drop actions inside folders as you’d do on the iOS 7 Springboard. I’ve long criticized the shortcomings of Launch Center Pro’s Action Composer, and it’s good to know Contrast is starting to provide solutions to those issues. 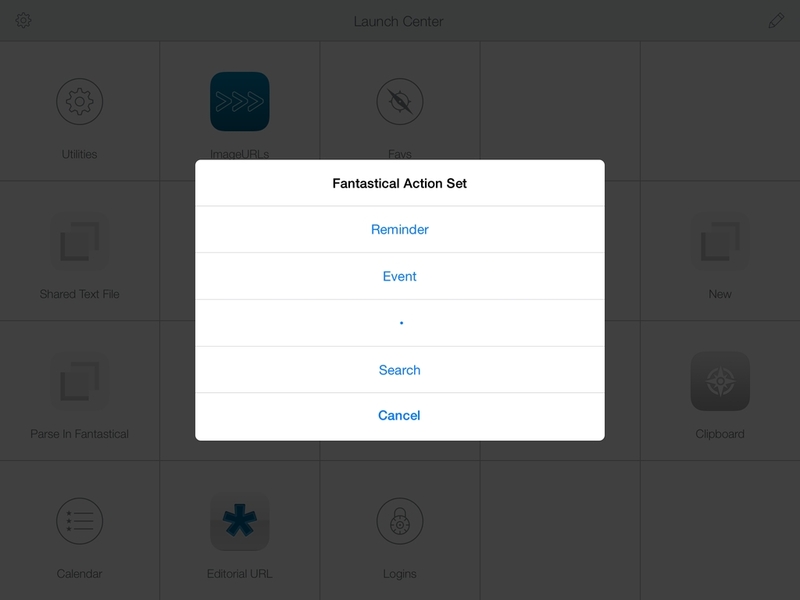 Launch Center Pro is an invaluable tool to save time with actions, and my iPad setup was missing a bridge between my Safari bookmarklets and Editorial workflows, my Pythonista scripts and Drafts actions, and all my other favorite apps with URL scheme support. With Launch Center Pro, working on the iPad is faster, more efficient, and fun. Launch Center Pro for iPad is in my dock. It may not be that different from the iPhone app, but it allows me to quickly launch Google searches, create events and reminders in Fantastical, upload photos, launch Editorial workflows, run Pythonista scripts, open websites, and so much more. I was waiting for Launch Center Pro on the iPad, and even if I think Contrast could do more with the iPad’s screen, that’s okay for now. Launch Center Pro for iPad is $4.99 on the App Store.